There will be no shortage of St. Patrick’s Day festivities in Los Angeles this year and with the festive holiday landing on a Monday, most people are going to get started a few days early. Splash Magazines Worldwide has put together a few of our favorite spots along with a few extras to help you celebrate this year. Rock & Reilly’s Irish whiskey pub has quickly set the standard when it comes to putting together a St. Patrick’s Day bash and this year their world famous block party is back will take place on Saturday, March 15th in West Hollywood. 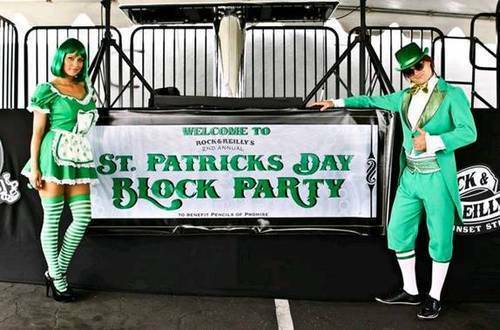 The block party has turned into the largest all-day drinking extravaganza on the Sunset Strip: Rock & Reilly’s 3rd Annual St. Patrick’s Day Block Party! Last year more 6,000 people attended the Irish party, and this year there will be more booze, less morals and of course, the same attitude! The Rock n’ Roll bar will transform their back parking lots into an outdoor festival, inviting all Irish and non-Irish partygoers alike. From Noon until 10:00 PM, there will be 12 Bars, more than 100 kegs of Bud Light and Guinness, carnival games, raffles (grand prize winner wins Reilly’s for a Year! ), a free photo booth and DJs spinning all day and night. 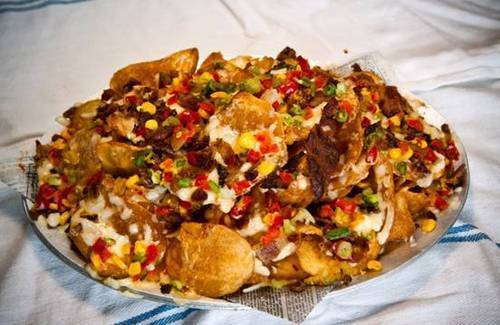 St. Patrick’s Day is more than throwing back a few pints of Guinness; food is a must on a day like this. You can try food from amazing food trucks like The Grilled Cheese Truck and Germany’s Famous Bratwurst, as well as a pizza, sandwich and salad station by Dough Pizzeria & Bar. This year, a portion of the proceeds from the event will benefit the International House of Blues Foundation (www.ihobf.org) and their dedicated efforts to building the future of music. Pre-sale tickets for the block party can be purchased at Rock & Reilly’s for $20 or $30 at the door the day of the event. For bottle service, please contact: VIP@randrpub.com. -The brine consists of salt, sugar, peppercorns, a little clove, mustard seeds, bailey’s & curing salt. – Slow roast for 6 hours at 225 degrees in Guinness, Carrots, Onions, Celery and Thyme. 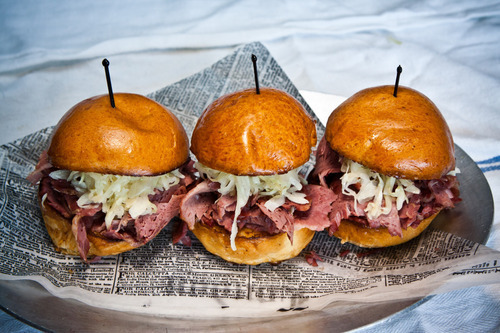 – Once cooked, it is sliced, rehydrated in the Guiness Auj Jous topped with sauerkraut, Dijon and placed in a locally baked brioche roll.